Holding is a skill that's half science and half art. 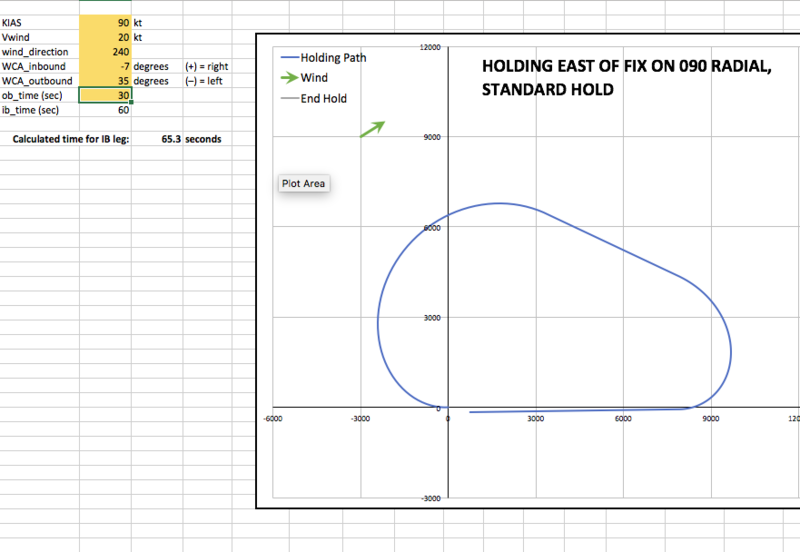 I'm an engineer and a musician, so I can appreciate both science and art, but my technical side yearned for a better understanding of the ways in which airspeed, wind speed, outbound time, and wind correction angles interact to produce a holding pattern. I created a spreadsheet that allowed me to visualize that. You can download the spreadsheet here. I am working on an interactive version for this website, but it's not quite ready for prime time. Just to be clear, this tool is not to be used in the airplane or for flight planning. Play with it at your desk and see how the various changes to your headings and times affect the shape of the pattern for various wind conditions. The inbound course is fixed at 270, and it is a standard hold. Standard rate turn begins immediately after crossing the fix, and ends at completion of the turn (no roll-in or roll-out). Outbound leg time starts at roll-out (I don't determine whether you have crossed the abeam point before starting the time). This is similar to the procedure you would use if you were holding at an intersection, where you couldn't determine the abeam point. Inbound and outbound headings are based on the wind correction angles that you set in the spreadsheet. A positive number means a correction to the right; a negative number indicates correction to the left. Finally, remember that this is just a tool for your entertainment and education. DO NOT USE IT FOR FLIGHT PLANNING, OR IN FLIGHT! Now that I've made that clear, enjoy!